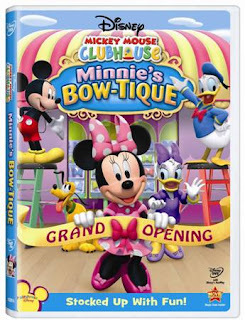 MICKEY MOUSE CLUBHOUSE: MINNIE’S BOW-TIQUE on DVD is new in stores today (2/9)! For the first time ever, Minnie Mouse will star in Mickey Mouse Clubhouse: Minnie’s Bow-tique when it comes to Disney DVD on February 9, 2010. This new release features four Minnie-themed stories including a never-before-seen episode and a fun Minnie magnet bow frame. Two episodes, Minnie’s Pajama Party, and Minnie’s Bee Story, include Disney’s Adventure Mode an interactive game using the remote control with multiple play levels. It’s the grand opening of Minnie’s Bow-tique, a store jam-packed with every kind of bow and bowtie imaginable. The selections include: the “Glow-Bow”, a bow that changes color with every mood; the “Grow-Bow”, a bow that grows to tremendous size by just adding water; flying “Butterfly-Bows”; and a “Photo-Bow” that snaps instant pictures. Problems arise when Pete, embarrassed about buying a lady’s bow for his favorite aunt, causes a few accidental mishaps in the new store. However, super salesperson Minnie finds the perfect bow for Pete. The Bow-tique’s grand opening is a success – and it all ends in a Big Bow Show with the Clubhouse gang modeling the latest fashions under the biggest bow of all, a colorful, sky-high Rain-Bow. In a never-before-seen episode, Minnie’s Pajama Party Minnie and the girls set up a fun Pajama Party sleepover for the day but it’s not as easy as it sounds, especially with the addition of Pete and Willie the Giant! It’s been a long time since I sat down and watched Minnie and Mickey Mouse and the gang and it was nice to see them all again. Who doesn’t love Mickey, Minnie, Donald, Daisy, Goofy and Pluto???? The classic characters never change. I don’t think Sadie has ever watched any of them so I wasn’t sure how she would react to the new DVD we got called Minnie’s Bow-Tique. I am not going to giveaway the story lines to the 4 Episodes that we watched cause that would just ruin it for you. It is a must have DVD and also features the Interactive Adventure Mode. Now we didn’t watch the whole 96 min in 1 sitting but Sadie seemed to really enjoy each episode we did watch and talked about Minnie and all her bows. Minnie is a girly girl…or mouse…and Sadie lapped that up big time. Her favourite was Minnie’s Picnic as she has been into picnics lately and watched and got ideas for her next one. Minnie’s Bow-Tique is a good choice for your DVD collection and will be enjoyed by kids young and old. My niece would be thrilled to have this!